Rowena’s life has been transformed by the practice of yoga, her family and the people she met. 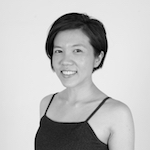 Yoga is a practice which Rowena strongly believes that can bring happiness to everyone on or off the mat. She is dedicated to a lifetime love of learning and hope to share with everyone she meets. Inspired to become a yoga teacher after her mother fell very ill, Rowena underwent teacher training in 2010 and has never looked back since then. As a mother of 2, she has an innate interest in pre-natal yoga and her teachings range from conscious birthing, all-natural childbirth and tips on how to make the pregnancy more enjoyable and comfortable. Rowena’s pre-natal classes are created to lessen the discomfort of the anatomical, hormonal and muscular change during the pregnancy. She sees each class as an opportunity for her to share the beautiful benefits of yoga to all, regardless of age, gender and size. With a special interest in yoga therapy and healing, Rowena sees herself as a facilitator in class. Tapping into the science of yoga, her classes emphasise on awareness and physical alignment that will help to improve overall health. What is your favourite type of class to teach? A Hatha Vinyasa class that focus on a flow of movement, alignment and breaths. What is your favourite pose? There are too many favourite for me to name. Everyday there will be a different favourite pose for me as our body changes everyday. What is your least favourite pose and why? That will be Mandukasana, the Frog pose for sure. In fact most hip opener poses, ouch! What keeps bringing you back to your yoga mat? The sense of peacefulness in the mind, the feeling of lightness and freedom in body and movement after a good practice is so addictive, just got to keep going back. What is the strangest place you have done a yoga practice/pose? I did a Warrior 3 at one of the world’s highest lake – approx 5km away from India to China, Tibet… Don’t think it’s the strangest, but is the most amazing and beautiful place for me. What always makes you laugh? My children especially my son Tenzin. Especially when he suddenly goes ‘boom, boom, boom’ and does his monster walk. What is one of your personal quirks/habits/idiosyncrasies? Regardless the weather is hot or cold, I can’t sleep without covering myself with a blanket. What is one thing about you that most people don’t know (until now)? I already have two children! Join Rowena for an inspiring class that will both give you a workout but be a therapeutic experience!